Welcome to the fourth town overhaul in the JKs series. Thanks to Blary for his awesome FoodContainer Resources and ChickenDownUnder for the apple trees meshes and textures and the carrot plants from his exellent Harvestables mod. Now go explore, there's a little more to see than shown in the images! enjoy. Version 1.3 available for download. Civil War guards update. 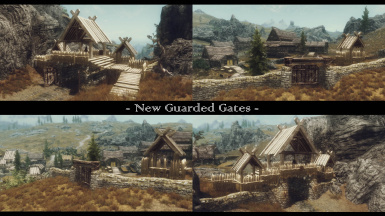 Guards will now automatically update based on Civil War progress. Version 1.2 available for download. Removed some floating assets from the whiterun planes. 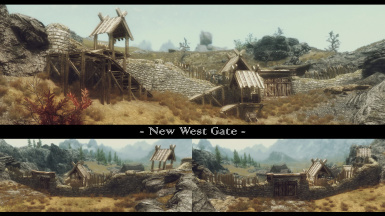 Added a blacksmith shop an a new gate to the west, please check the image section for a preview, hope you enjoy the additions. Version 1.1 available for download. Deleted some meshes that I added by mistake that probably was causing missing textures problems for some users, my apologies! please uninstall and delete the old version and install the new 1.1. I just wanted to let you guys know that Nazenn is going to take over my cities and towns overhauls from now on. I'm not retiring from modding, I'll still be working on DarkenD, I have an update coming soon with some new content. I want to express my gratitude to all of you guys for the comments, the support and the endorsements, thank you so much!. As has been announced I'm going to be taking over maintenance of JKs city and town mods while he moves onto other stuff. At this stage I'm not planing any content updates, or patches, however I'll still be fixing any major bugs or issues that arise in the files so please do keep reporting them. JK has also asked me to handle any permissions questions that come up so feel free to direct them my way as well. As far as I'm concerned, and the way JK has always approached it, there's open permissions for compatibility patches, although please do let me know that you have made a patch is all I ask and give me a link to it, but for anything more then that please ask me first before publishing. As per JKs request, I will also be doing the conversions for all the remaining cities and towns over to SSE as well which will be coming in the new year once I have my new PC set up. Please don't ask me for an ETA, I don't have one, but where possible I'll also bring them to console as well. I'll also be including the bug fixes I worked into JKs Lite to fix a few little things that people may be running into problems with. I don't regularly check these pages for new comments due to their age so if you have an urgent bug to report, your best bet to get in touch with me would be to toss me a PM on Nexus or Reddit. Alternatively, I have a small discord channel set up for various modding projects you can join by clicking here which I'm pretty much on every day so come and have a chat about these files or any other mod you wish. I use touring carriages, and it really doesn't like Rorikstead with this mod installed. I get to the section of road with all the carts and the pathfinder for the horse & cart can't find a way by. I have tried deleting object with Jaxsonz positioner and 'disable' command, and just moving them out the way with positioner but the cart is stuck. Is there any work-around for this? EDIT: okay, I've found a slight work-around... But it's a real pain... Using Jaxonz positioner I select the horse and move him closer to the gate and drop (not lock), then tell the driver I want to stop here (because the horse detatches and no longer pulls the cart), wait for the animation, then tell him I want to get back on (this resets the cart and snaps the horse back to it), I can then get through the gate and carry on my journey... Still, a REAL pain though! This problem was driving me crazy! I don't use Touring Carriages, but the issue is the same for followers (and guards, if you watch them long enough) right at this section of the main road next to the loaded cart. If you start with your followers in the center of Rorikstead and run backwards towards Whiterun, you can actually see the point at which they stop moving directly towards you and move diagonally towards the cart, as if being invisibly pathed towards the cart/storehouse. Then they stop next to the cart and start milling around. Occasionally a follower will break free and catch up to you at the eastern gate, but more often than not they remain stuck and you have to fiddle around (or enter an interior) to get them free. The problem is the same if they follow you through the eastern gate towards the center of Rorikstead. Like charlyxx, I also tried deleting the objects in the roadway with Jaxsonz Postioner, and also with TES5Edit, to clear the way, but this did not resolve the issue. The problem, I think, lies with the navmesh where the two cells on either side of the road are merged. (For reference, the cell on the right as you stand at the eastern gate facing Rorikstead is RoriksteadExterior04 [CELL:00009596] (in Tamriel "Skyrim" [WRLD:0000003C] at -20,1) and the cell on the left which contains Ingol's house is [CELL:000099B6] (in Tamriel "Skyrim" [WRLD:0000003C] at -20,0)). To test this, I used TES5Edit to open JK's Rorikstead (after reinstalliing it to restore it to its original state) and tried deleting both of these cells, one at a time, from the mod. I did this singularly, reinstalling after each test, so that only one cell at a time was ever missing in-game. I found that after deleting cell 00009596, the navigation problem persisted, but that when I deleted cell 000099B6, everything worked perfectly, and followers would now move up and down the road just as they should. However, deleting cell 000099B6 also means you lose the eastern gate (one of the best parts of the mod!) 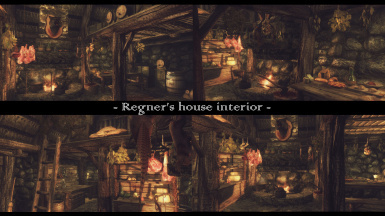 as well as Ingol's house, although it leaves his door floating in midair and you can still enter the interior. My solution, however inelegant and time consuming, was to reinstall the mod in its original state (before editing anything) and then use Jaxsonz Postioner in-game to copy each object found in the cell and lock it into place. (3) lock it in place over the original object placed by the mod (by pressing "Enter" again). The commands for Jaxsonz can be found in the MCM if you need to reference them while doing this. 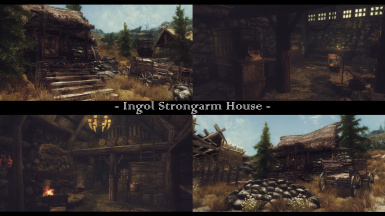 NOTE: You don't have to copy Ingol's doorway, it will still be placed in-game as long as the mod is active. Once everything I wanted to keep was copied, I saved the game and exited. 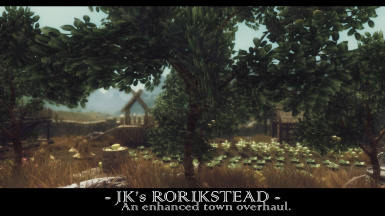 Then I opened JK's Rorikstead in TES5Edit again and deleted that pesky cell 000099B6 for good. Upon reloading the game, the copied objects remained in place, but the issue with the navmesh from the problem cell was gone. Of course, at this point I had to use Positioner again to adjust the placement of the copied objects, since deleting the cell removes the changes the mod makes to the terrain in this area, but with a little rearranging everything looks presentable, and I get to keep the eastern gate! Ingol can still be found in his house at night, although I didn't follow him around to see if he actually walks up to the door and enters the house in real time. This fix should work with Touring Carriages, although you might also have to delete the loaded cart in front of the storehouse if there's not enough room in the road for the carriage to get past it. It's a lot of effort for a relatively minor navmesh problem, but if issues like this break your immersion and cause you to hurl unwarranted obscenities at your hapless followers, this is the only solution I know without delving into the deeper waters of navmesh editing and the CK. As a disclaimer, I should add that I'm quite new to modding and this was a learning experience for me, but I'm quite pleased with the results, and I can now use this cool mod with no hassles! Skål! So this one in particular causes crashes in Frostfruit Inn when ported to Special Edition, which none of your other mods do. And occasional crashes when walking around outside in Rorikstead. This is just a simple guide on how to port over each of Jk's mods for personal use and not to be reuploaded without JKrojmal OR Nazenn permission - feel free to correct me or make this guide better. 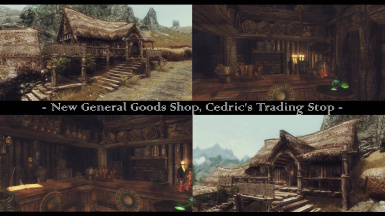 You can follow this guide and port over Jk's full skyrim mod ( Nazenn said it should work fine ) or do what I'm suggesting and port over all of Jk's mods except Whiterun, Riverwood, Skyhaven Forge and Dawnstar - Loads of accounts of ctds when approaching. 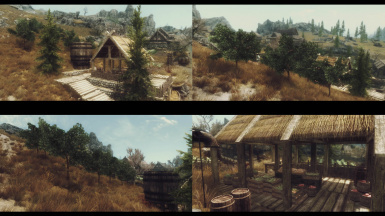 JK's Skyrim - http://www.nexusmods.com/skyrim/mods/61035/? - Again might have probelms with this one because of Jk's Dawnstar + If you have problems with any over of the cities, village, etc you cant just disable that one city. 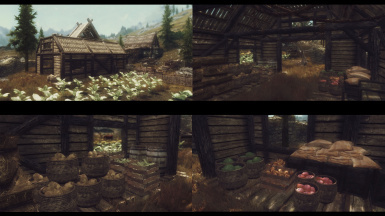 JKs Skaal village - http://www.nexusmods.com/skyrim/mods/79163/? 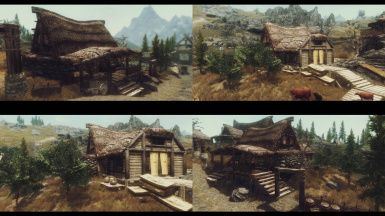 Tip - Dont download any patches for any of mods they will be for Skyrim LE (Oldrim / Skyrim 2011) and may not work for Skyrim SE, I also wont be using open cities, or any type of mod like that since that may not be compatible for these mods. 2. Go to https://bethesda.net/en/dashboard and click the download launcher in the top right hand corner - then download, while that's downloading create a account if you haven't already. Follow the install steps when installing the program, pretty much straight forward. Then once downloaded open it and find the skyrim creation kit and click the big green install button - wont take too long. Save and exit and make sure you have show hidden file extensions turned on - https://gyazo.com/7538a005e1bf4afac795157c683cd74c - then rename the whole document to CreationKitCustom.ini and click yes to any admin permissions that pop up. 4. 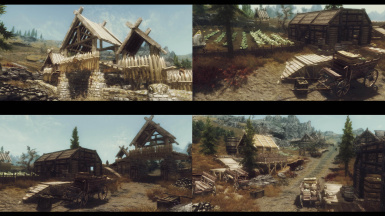 Download SSE Nif Optimizer manually and extract to any place like your desktop or like me a folder called Skyrim Mod Tools. !!! IF YOU USE MOD ORGANIZER SKIP STEP 5 AND GO TO STEP 6a !!! 5. Now we are ready to actually start to port over the mods ( By the way this should work for nearly every oldrim mod BUT mods with BSA files and the exception of some over mods will need a few more steps, but because Jk's skyrim mods dont use bsa files we are okay - dont follow this guide for other mods with BSA files, YOU'VE BEEN WARNED). I'm going to use Jk's solitude for example in this guide, find your already downloaded mod ( for me this is Jk's Solitude ) and put it on your desktop for ease of access and right mouse click the rar file and click extract here. 6a. (for the pros that use MO - Recommended Mod manger). If you are like me and you use MO we are going to want to open creation kit in MO by clicking the drop down menu where your Skyrim - https://gyazo.com/687bb5fa4c8a1add2e294414f60729c0 - and click edit, a lil window will pop up we are going to want to add creation kit in there if it isnt already there, copy what mine looks like - https://gyazo.com/fb1ad51859cdd07d6aae8c9714431c0b - and then click the add button where it says modify for me. Then simply run Creation Kit and click the file then data in the top left hand corner, finding Jks solitude and setting it as active file - https://gyazo.com/54846e645f432d6c970e4865b75b864b - then click okay, you will get loads of warnings, on ALL OF THEM CLICK YES TO ALL! - D:\Steam\steamapps\common\Skyrim Special Edition\Data - now open Skyrim creation kit, once eveything is loaded a bunch of windows will open ignore them and click File then Data in the very top left hand corner and find your Esp that you just copied into you skyrim data ( mine is Jk's Solitude.esp ) double click the little box so it has a cross in it and click set as active file - https://gyazo.com/40dca4b9e4f2de80753cb7784c9e4234 - then click okay, you will get loads of warnings, on ALL OF THEM CLICK YES TO ALL! 7. Once, the esp has loaded simply click the save button in the top left that looks like a little floppy disk - clicking yes to all of any of the pop ups, then close out of creation kit. But wait there's more to do yet! 8a. Go back into MO and you will find you have stuff in your overwrite folder if you do GREAT ! you did it correct, now what we wanna do it find out MO folder and do all this there well because its a lot easier! To find your MO folder go to where you installed you mo folder for me I installed it in my skyrim se folder because, ease of access - D:\Steam\steamapps\common\Skyrim Special Edition\ModOrganizer - now go into your overwrite folder and copy anything that is in there, the esp, meshes and textures and cut all of that stuff into your Jk's folder on your desktop overwriting anything that pops up - the one from earlier. 9. Now your folder will probably look like mine - https://gyazo.com/35cfbf5bdd7f406ec43792c1a1d67269 - we are going to want to open our Nif optimizer from before ( mine is in my folder called skyrim mod tools ), once opened click the browse button and basically just find your jk mod on your desktop should look like this - https://gyazo.com/8c6e34613ce1d3f446833731839d06b2 - then click optimize, close out of it that's all done now. (Mine says JK's Solitude) then add that mod into your mod manger and enable it, that's it all done in top not so simple steps. 11. Now we have done pretty much everything its time to test it, open your skyrim and open any save thats close to a new game save or a new game altogether and press the console key ( if you dont know the console key its the key left of your 1 key ) and type in tmm 1 to unlock all locations on your map, exit out of the console via console key and open your map and travel to the location of where the mod changed for me in this guide I used Soltiude - walk around a bit in the city, village, etc and see if its all work. Now if you crash you can do 3 things, delete the mod and do everything all over again. 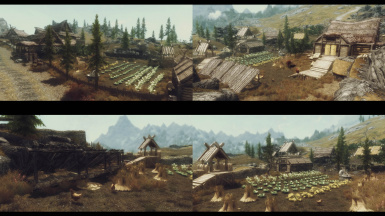 Or use this guide and clean your mod esp just in case ( https://www.creationkit.com/index.php?title=TES5Edit_Mod_Cleaning_Tutorial - can use any guide that does the same thing online ) or you can simply turn off the mod in case that mod just doesnt work with Skyrim SE or in case the area is being edited by another mod you have installed. Again this might not work for every mod for oldrim but for most it should. !!! Dont have a go at me if you brake your game and have to reinstall it again, if you follow the steps you should be fine !!! Please feel free to reply to this comment on anything I missed or that needs changing especially for the NMM part of the guide because I dont use NMM. Is there any hope for a dumbed down version of this for ps4? 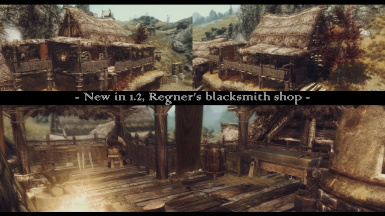 All these nice architecture mods I'm seeing on nexus, it's a shame the bethesda.net modders don't care for buildings a whole lot. Thanks for the free horse. I named her Sugarloaf. Going out the eastern gate, my followers tend not follow me out the gate, but they do not get stuck. They go around and catch up to me on the other side. I don't have any issues with them leaving Rorikstead by any of the other gates. I think it has something to do with the wagon near the eastern gate because they tend to congregate there before deciding how to leave the village. 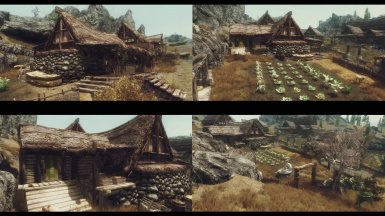 I really, really LOVE the work gone into this mod, Rorikstead is now a fortified breadbasket of skyrim as it ought to be since its so close to the reach. However, as i also use and love Touring Carriages I found that the Navmesh leaving the town in the direction of whiterun is broken and the carriage cannot exit, I've tried to fix it myself and failed. If you perhaps could fix the navmesh so that the touring carriages could exit towards whiterun id be much obliged. 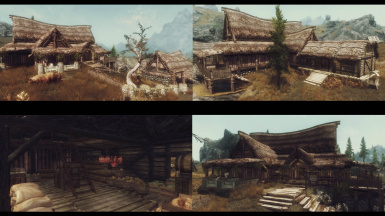 As that mod uses rorikstead as an almost hub for many different routes throughout skyrim, I dont want to play without your incredible overhaul but will likely have to if i want to be able to exit the city headed southwest in the carriages, I know i could just use a horse, but i like the scenery.